I just discovered ZenWriter, and I am so in love with it. For those of you who have never heard of it, ZenWriter is a program that gives you an open, peaceful place for composing your thoughts. It’s a fullscreen text editor that offers customizable backgrounds, music, and a nifty word count at the bottom of the window. By default, there’s also a typewriter sound effect that coincides with your keystrokes (and makes you feel like the next Hemingway, just so you know). It even saves your work automatically, so you don’t have to worry about losing anything. The fullscreen format helps cut down on distractions and keep you focused on writing. The music and backgrounds are calming, which reduces any blinking-cursor-on-a-blank-page anxiety you might feel. Since I started using this program, I’ve consistently written 2K every day. In fact, my last two installments of BLOOD AND WATER were both written in there (and then copied and pasted into Scrivener for safe keeping). There are only two downsides I’ve found to this program: it doesn’t offer formatting options, and it saves your work as a text file, rather than a document. Of course, I like the lack of formatting and spellcheck in the editor because it keeps me focused on the task of writing, rather than the tedious details that come along with it. As for the saving as text issue, it doesn’t affect me because I copy and paste my work into Scrivener, anyway. Bottom line: if you’re like me and prefer to do your actual writing in something besides Scrivener, ZenWriter makes a friendly and effective alternative to Microsoft Word and other office suites. Give it a try and see what happens. What do you have to lose? 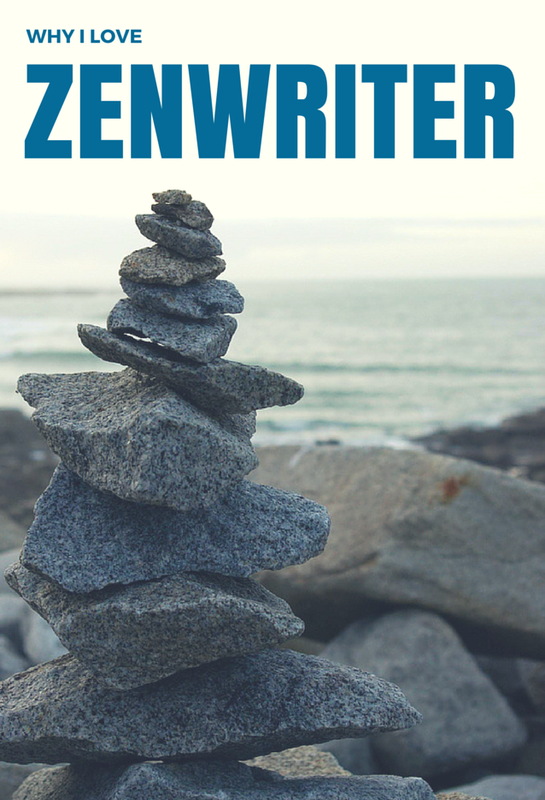 A free trial of ZenWriter is available here, as is the $17.50 license for the full version. I can honestly say that it’s worth every penny. Have you ever used ZenWriter or another distraction-free text editor? What did you think?